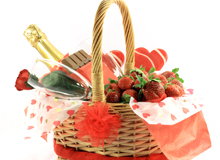 A food gift basket is one of the best personalized gifts you can present on Valentine’s Day. A pretty cane basket filled with both edible and drinkable goodies are sure to please your family and friends. 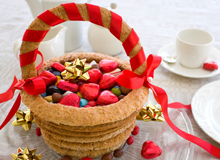 Making your own Valentine food gift basket is quick, inexpensive and easy. All the food items may be purchased, or some delicacies can be home-made for that special, personal touch. Below are some ideas for Valentine Food Gift Basket depending on the budget you are willing to spend and the recipients’ preferences. Feel free to use your imagination and experiment with new gourmet additions. Do not forget to wrap the final product in cellophane and colourful ribbons. Chai/ Coffee Connoisseur Basket: Make a visit to your neighbourhood gourmet shop and pick up a box of Fair Trade organic green tea or coffee, tender whole wheat chocolate chip cookies, packets of unrefined (brown) sugar, and a pair of pretty zodiac coffee mugs or one of those hand-painted terracotta tea set. For health-conscious folks, you can skip regular versions with decaffeinated flavoured tea (chamomile, ginger-lime, oregano or rosemary), or coffee bags and a bottle of certified organic honey organic honey (natural sweetener) with few packets of multi-grain crackers, assorted cheeses and a jar of mixed fruit marmalade. Chocolate Basket: This option is ideal for great lovers of chocolate. Fill your colourful, stylish basket with home-baked rich chocolate muffins, couple of good-quality dark chocolate bars, bottle of instant hot chocolate drink mix, pack of chocolate chip cookies, little bottle of chocolate chai, box of chocolate biscotti, and a packet of chocolate brownie cereal bars. Little Italy Food Basket: Delight the Italian cuisine lover, with a Thailand cane basket full of organic whole-wheat pasta packets, readymade heart-shaped pizza dough, bottle of red wine, jar of good organic tomato, garlic and olive pasta sauce, Italian truffle oil, Godiva chocolates, bottle of special herbs (basil, garlic and rosemary), balsamic vinegar, artisan cheeses, and pack of dried mushrooms and cherry tomatoes. Adding a pair of pasta tongs and cute olive-shaped pepper shaker will be the icing on the cake! Spice Bazaar Basket: If your darling loves experimenting with traditional cuisines, spice mix can be a great gift option. Most store bought regular herb and spice blends are expensive and a contain loads of anti-caking agents, additives or Love messages. Buy organic whole spices at your local health food store and roast at home. Now, put each mixture such as curry powder mix, lemon pepper seasoning, chilli seasoning, herbs de provence, taco seasoning, pizza seasoning, italian seasoning and salad dressing mix in nice air-tight glass jars or bottles. Do not miss to tie “spice-blend name” tag with a pretty ribbon. Snack-Lover’s Basket: Pack a gift box with a wide selection of delicious baked snacks, sauces, crème fraiche, preserves sausages, and lots of dips perfect for snacking. Soup Medley: Nowadays, many people love to combine a wholesome, healthy soup with dinner. Buy an assortment of different preservative-free soup powder packs, bottle of lime juice, a wooden pepper grinder, pack of dried mushrooms, bottle of chillies, tomatoes and garlic paste, seasoning herbs pouches, and a bottle of Italian Cheese Sprinkle. Sure to please any food lover. Sweetmeat Basket: Clay pots filled with Roshogollas, Gulab Jamuns, flavoured curd along with variety of Ladoos and dry fruits is sure to catch your Valentine by surprise and get them hooked. Mix Fruit Basket: This simple option would be surely appreciated by anyone. Visit your local market and pick up different fresh, seasonal fruits. Now, pack your teak-coloured cane basket with gorgeous towers of colourful fruits along with pretty glass jars filled with dried nuts and home-made fruit juice punch. One Response to "Valentine Food Gift Basket"